For decades, I have watched National Geographic and other documentaries about the Great Migration that occurs each year on the Serengeti. Always wanted to see it in person. Millions of animals…primarily wildebeests and zebras…seek water and fresh grasslands, as the seasons change in Tanzania…Eastern Africa. At one point, the Mara River must be crossed to get to the better grazing lands and water. This is the spot you have undoubtedly seen…where huge numbers of animals plunge off the side of the river embankments, into the water and onto the rocks and swim/run/walk across the river with giant crocodiles picking off the injured and swarms of vultures circle overhead…awaiting a meal. Once the survivors reach the other embankment, they have to find a way to scramble up the muddy, slippery, steep and highly congested trails to get to their promised land. Many fall backwards, back onto their fellow beasts and some right back into the water. And a few…a few find themselves completely uninjured, but hopelessly wedged between rocks in the river…unable to move despite their desperate efforts. It is just a matter of time before the crocs come for dinner and the vultures clean up what might be left. 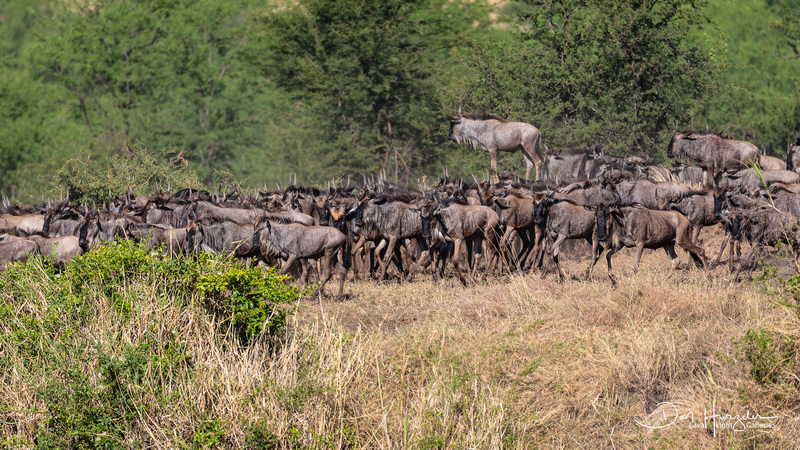 In early October 2018, my wife and I participated in a photo safari that was designed to perfectly time our eleven days on safari so we could witness the Mara River crossing. The safari was a cooperative effort between Nature’s Best Photography magazine and Thomson Safaris. They did a perfect job on all aspects of the safari. The best part…despite many possible other outcomes…they did, indeed, put us at just the right spot at just the right time for an unbelievable 40 minute crossing of the Mara by tens of thousands of animals. When it was all over…I found myself unable to speak…I was completely choked up with emotion. Linda and I have never seen anything like it. The animals are apparent for days before the crossing. You start noticing mile long columns of them slowly walking, and sometimes running, through the Serengeti…headed in the general direction of the Mara River. One morning I saw a line of them that reached as far as my eyes could see. Other times, we would encounter great herds of them grazing or slowly headed toward the river…herds of many thousand animals. 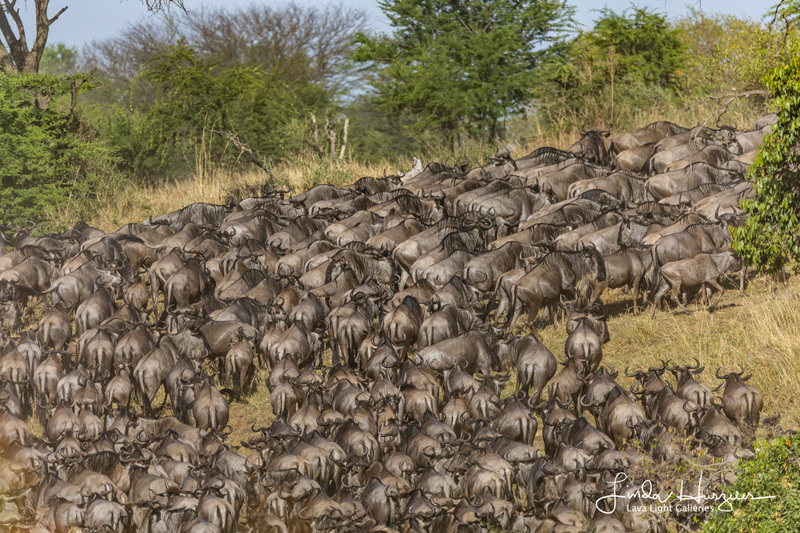 Some herds were wildebeests only. Others were zebra only. Sometimes they were all mixed together. And you could see the problem…the water was drying up and the vegetation was eaten right down to the dirt. In fact, dust was a hallmark of these herds…big clouds of dust everywhere they went. The morning we rolled up on the Mara…the animals had beaten us there. They were staged in groups that seemed to reach back to the horizon…they were everywhere, except in the water. Our guides explained that there may or may not be a crossing today. If there are too many crocs in the water…if the other tour operators were not careful to hide their vehicles in the bush until the crossing started…if…if…if…the crossing was not guaranteed. And then all hell broke loose. The sound hit us first…the sound of a stampede and of chaos. Clouds of dust filled the sky. I looked directly below me…and I mean directly below me…and saw a stampede going on along the ledge of the river…just ten feet below. 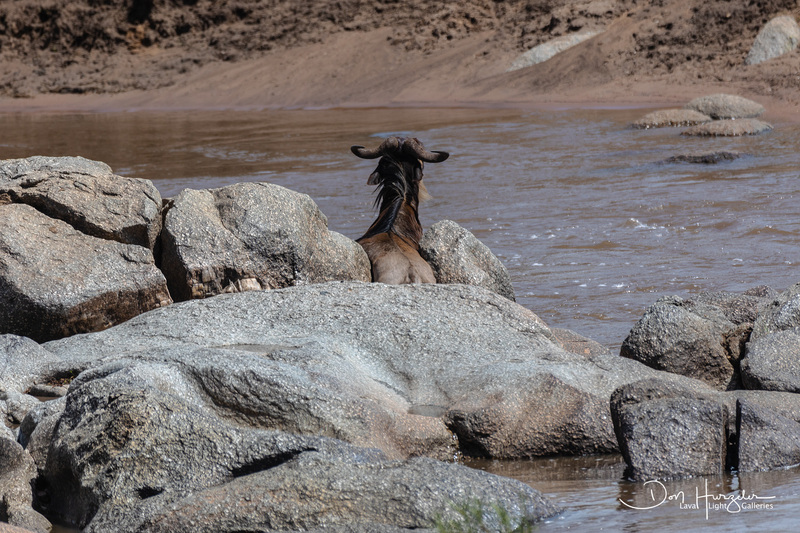 Off to the right, the wildebeests were leaping maybe 15 feet from the ledge and into the river. The crossing was on…big time. We positioned ourselves for relative safety and for a clear view of the action that was just in front of us. Hard to know what to photograph first. The line of animals formed into three lines of animals…each line several animals across and traveling as quickly as their legs could carry them through belly deep water. 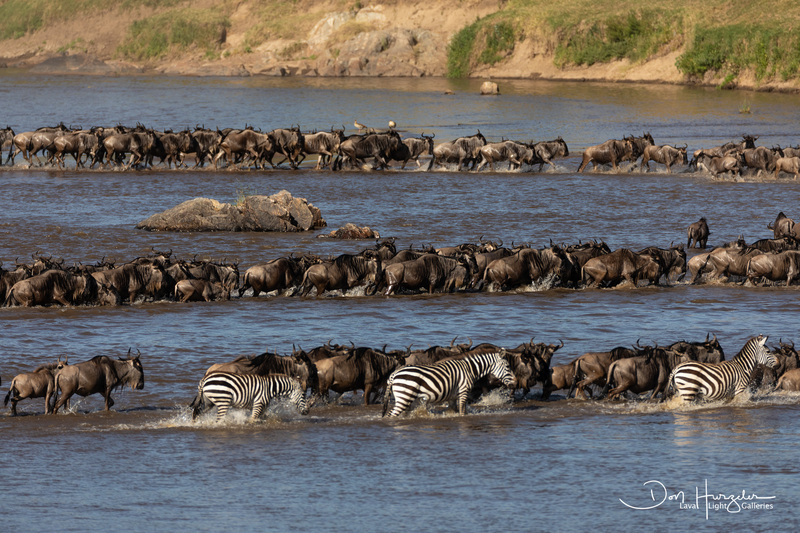 In one or two spots they had to cross the rocks that would end up trapping a few unlucky wildebeests. In a couple or more spots, they had to swim…but not for far…just enough to cause congestion and panic in the water. I don’t think I saw any animals taken by crocs that day…but who would know. The crocs could grab one and pull it underwater and no one would even notice in the commotion of the moment. I did see a croc go for one the next day…missed…and shut down and turned around another full crossing. The crocs looked very well fed and we did come across some carcasses of wildebeests down river…as yet untouched by croc or vulture. I shot the whole event with a Canon 5D Mark 4 and a Sigma 150-600mm Sport lens. I had Sony A7R3 with me with a 70-200 lens and fired off a few frames with that as well, plus took one poorly shot video. The action was so fast and so compelling that I didn’t do much composing…just shot away at whatever got my attention. I did zero in on one spot where I noticed a ray of light that might fall upon a wildebeest lunging off the cliff…but it would have to be a super leap to hit that spot. So…I focused in on it and waited…and one star jumper hit that spot in midair. 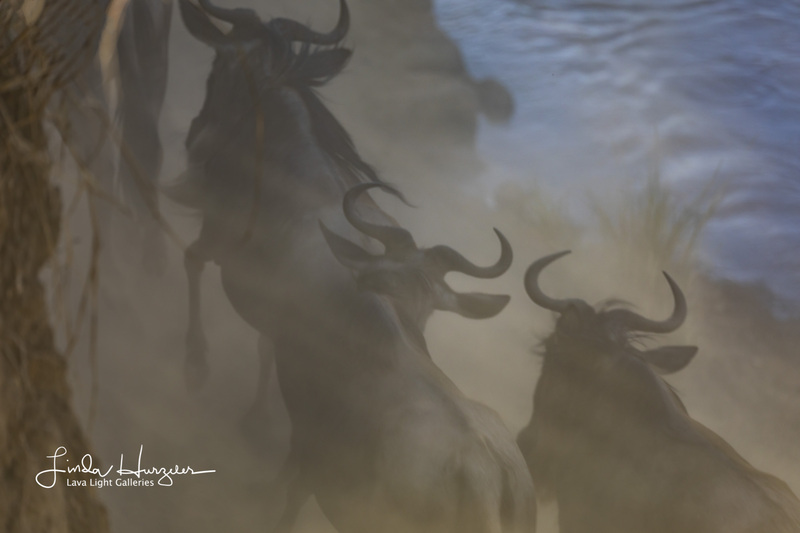 Bam…got my best shot of the whole safari…a single wildebeest in midair, spotlighted in sunlight, against a background of many other animals, dust, vegetation, shadows and river. We saw strange things happen during the crossing. A number of animals made the full crossing…made it to safety…turned right around and crossed again to the original side. We saw animals standing fully on the backs of other animals. Heard sounds we have never heard. Saw chaos in it’s purest form. It was just plain amazing. And then it came to a screeching halt. Just like it started…it stopped…in an instant. The river looked like nothing had ever happened there. The herds on both sides of the river moved away from the river. The crossing was over at that spot for now. We would try again tomorrow…with very little success. As mentioned, the crocs scared them off the next day and a couple of the tour vehicles kind of botched things up as well…a little too anxious to please their customers and may have spooked the herd. Our guys hid well back in the bush and waited patiently for the crossing that never really materialized that day. So…a dream come true for us. Few things in life are more impressive than you think they might be…but this was one of them. In fact, the whole eleven days of photo safari was like that. I quietly told Linda at the end of day one that I had enough quality photos already that, if disaster struck and we had to go home tomorrow…I was good with it. 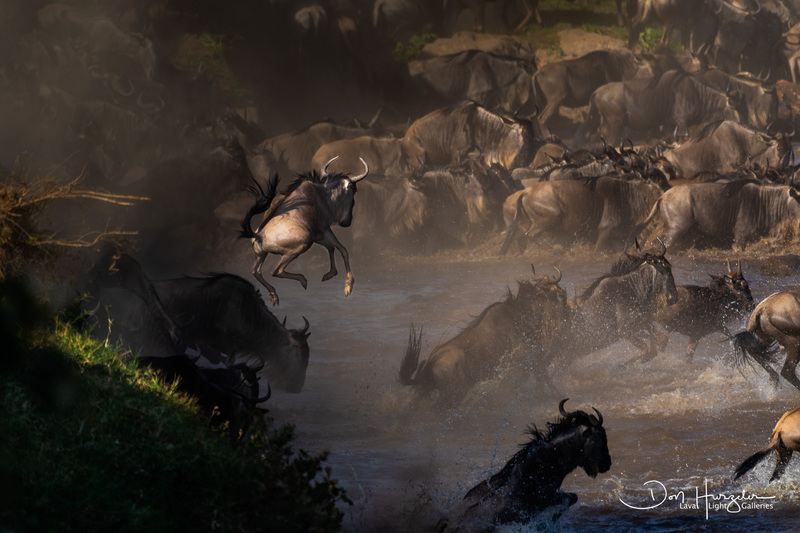 Between the two of us, we took over 30,000 images on the safari…and one of them that I will think about until the day I die…a flying wildebeest jumping into the sunlight high above the Mara River. Posted in Uncategorized on October 17, 2018 by Lava Light. ← Previous: "Magical Encounter on the Road to Tarangire National Park, Tanzania"
Love the pictures and what you wrote makes you understand more of what you saw…. Don, I can only imagine just how breathtaking to see this in person…to experience the sight and sounds of it! It is so awesome that you and your wife, Linda, who both have such a passion and expertise for photography, were able to go and fulfill the dream you had wanted to do! And to capture those moments so spectacularly! So wonderful to share with those of us who likely will never see Africa! What a gift! Thank you! Because the next best thing to actually being there…is for someone like you to go….photograph it, and describe it so eloquently so the the reader and viewer is able to share in the experience! I can understand how being there and watching all of it left you speechless and in awe! Beautiful! Great write-up on a “one-in-a-lifetime” experience! Keep up the awesome photos and writing, as it made me feel as though I experienced a little of this chaotic beauty as well. Don, I love the narrative as much as the images. Simply astounding what y’all experienced. When it comes to photography, you’re a man after my heart! Can’t wait to see your and Linda’s work at the gallery…see you in late Feb. Your writing is as eloquent as your pictures are stunning! Thanks for taking us along for experience! The photos you and Linda took, along with the narration are phenomenal. Thank you so much for sharing your world with so many. Don, thanks for an amazing eye-witness report on one of the animal wonders of the world. The fact that this spectacle reoccurs year after year is astounding. You are both indeed fortunate to have seen this for yourselves – an annual event that most of us will never see for ourselves. How fortunate that we are able to benefit from the talented eyes of you and Linda. Descriptive and interesting – I want to see that photo. Is it on the lava light gallery website? I’m really enjoying all your blog posts. Keep them coming. Is there a book here? Thanks to you and to Linda for sharing – many of us may not make this trip except through the and with you. You are making it amazing. Don, you’re a wonderful writer. Reading your blog post I felt like I was there. What an experience…as you said, the trip of a lifetime. I’m thrilled that you and Linda got to witness one of natire’s Most dramatic spectacles, and report it so colorfully to those of us back home. Dan…I love that you are still on prodigy. I remember when we use to own a third of Prodigy. I am still on AOL…just myself and a older couple in Nebraska left on AOL. Aloha. I never need to think about something great I should see..I need only follow you both. Thanks for sharing. Your written word is as impressive as your images.